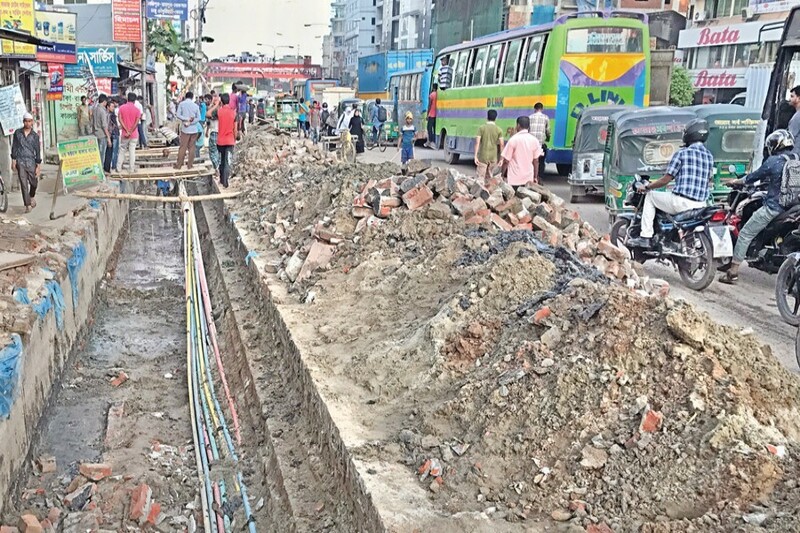 Leaving work sites in a disorderly state upon completion of repair works on public thoroughfares is a common practice in Dhaka city. A similar picture is also seen in the aftermath of digging works for laying or relocating underground utility pipes and cables. These types of work require the agencies concerned to make trenches and tunnels. These are essential parts of the job. But the flipside is that few of the parties commissioned for the job are found completing the works to the full satisfaction of the people in a particular area. With loosened earth, dusty or muddy, heaped in piles or remaining littered messily in the area concerned, few sites get back their earlier finished shape — that, too, on time. The burst of energy with which a work is undertaken is found mostly missing after it is over outwardly. Since most of the cases witness poor and haphazard finishing, a road or a footpath remains unfit for use. Instances of work sites remaining unusable for inordinately long period are plenty. In the meantime, the road or footpath users are made to go through ordeals while crossing those sites. On occasions unwarranted hazards or mishaps wait to happen, with unwitting persons finally falling victim to awkward situations. The recent incident of the wheels of a BRTC double-decker bus in the city getting stuck in a poorly filled-up roadside trench is a case in point. Since the bus was slowly coming to a stop, an accident could be averted. But there are no reasons for feeling relieved. With a bus running in full speed, a future incident in a similar circumstance might turn fatal. The style in which the road repairing and digging works are being carried out in the capital is awfully slipshod, if not terrible. Elderly and female passersby along with small children frenetically negotiating the carelessly dug out roads are a common spectacle in Dhaka. It occurs to few engaged in the digging of trenches and earth-filling that the areas remain vulnerable for some time. Since they view it as a normal practice, most of the utility agencies finish their jobs sloppily. They evidently do not have any compunction after they leave the repair sites in an unfinished and hazardous state. Acts like this cause hindrances to smooth public movement. In fact this insouciance adds to the myriad urban woes already plaguing the lives of the citizens. Untidiness in projects involving public interest is hardly encountered these days even in many developing countries. It boils down to the fact that they have elevated themselves to a level of efficiency. Many other nations have pathetically failed in this task. Disappointingly, global indices often include Bangladesh in the list of these nations. That this inclusion tarnishes the country’s image doesn’t elude the policymakers. The irony is they appear to have become inured to this dreadful reality. The authorities concerned can learn a lot from the neat style of work adopted by the MRT-6 project engaged in the construction of the elevated metro rail. This is a gigantic Japan-aided work, involving massive digging and installation jobs. Notwithstanding some initial public inconvenience, the metro project is now smoothly in place — thanks to the alternative arrangements for traffic and pedestrians alongside the project site. The utility services should learn a lesson from this project and spare the public the trouble on account of their messy repair work.